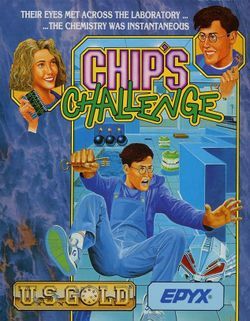 Chip's Challenge is a puzzle game first released in 1989. Each level requires Chip to collect chips and solve puzzles, all while dodging traps and enemies. The basic plot of the game is that high-school nerd Chip has met Melinda The Mental Marvel in the school science laboratory and must navigate through Melinda's "Clubhouse" (a series of increasingly difficult puzzles) in order to prove himself and gain membership to the very exclusive Bit Buster Club. This page was last edited on 11 June 2015, at 01:48. This page has been accessed 72,949 times.